Sea Garden is located in the heart of Hurghada, few steps away from where the city’s most cosmopolitan avenues begin and 100 meters away from the new Hurghada Marina, where you can see the best view of the Red Sea and wonderful boats from all over the world. 94 rooms. They are all cozy and bright. Light, comfort and a space ready to provide our guests with everything they need. Sea Garden Hotel is also ideal for families. Some of its rooms are large enough for an additional bed. Air conditioning, central heating, satellite dish, direct phone line, mini bar, a large selection of amenities to satisfy all your needs. They are relaxing and perfect for couples. Comfort, light and silence are the words which define a stay in one of our Standard rooms. Sea Garden Hotel Junior suites are approximately 44m² in size. 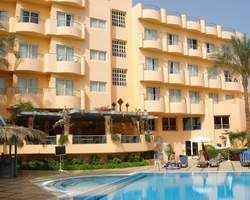 They have a small lounge and are ideal for couples visiting Hurghada. Camus Restaurant seats up to 120 guest for breakfast, lunch and dinner. It serves a variety of International and Oriental food in an open buffet style and a’la carte to suit all tastes. Camus Restaurant serves breakfast buffet from 7:00-10:00 and dining from 19:00-22:00. A lovely place to chat and have a drink in the evening. La Palma Pergola is overlooking the swimming pool, offering refreshing drinks, delicious snacks, grills and light salads. It also provides oriental corner which serves the famous Shisha (water pipe), Turkish coffee and oriental specialties. Embracing music and exquisite lighting create an encouraging atmosphere for reading, chatting or working in Sea Garden Hotel lobby. The Lobby has a direct access to the shops and swimming pool area. Enjoy Sea Garden Hotel sandy beach, located 100 meters away from the hotel, where the atmosphere is dynamic and exhilarating.